This is a simple punch where the ice is the center piece. Not only is the icy hand super spooky, but it keeps things cool as well. Take 2 (always good to have an extra hand) latex gloves, put them on and wash your hands with dish soap. Rinse well and turn the glove inside out so the just washed side is on the inside. Next, fill the gloves with water, tie the end and freeze. Once frozen remove the glove and you are good to go. Chill the Vodka (in the freezer) and Soda (in the fridge) for at least 24 hours. Just before the party combine the two liquids in a large punch bowl. Add a few drops of the red food coloring to make it blood red, well maybe more than a few drops. 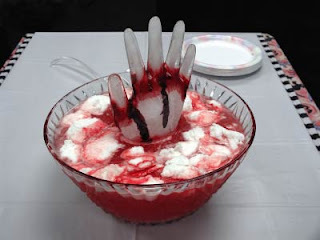 Add one of your icy hands in the center of the bowl, throw in the marshmallows and squirt some more food coloring over all of it for extra bloodiness.